Chobani is set to open its new innovation and community center in Twin Falls this summer. The 70,000-sq.-ft. facility is an expansion of the existing plant and will serve employees and guests, and house the company's global research and development team. The expansion will feature a 7,000-sq.-ft. gathering space for town halls, shared meals, daily relaxation and special celebrations, a 2,000-sq.-ft. fitness center and wellness rooms for new mothers. Sustainable design features include 4,000 sq. ft. of “smart glass” windows which enhance natural light while regulating internal temperatures and reducing the use of heating and air conditioning; an expansive skylight at the center of the building to reduce lighting needs and 30,000-sq.-ft. of “smart roofing” which will reflect sunlight and reduce heat absorption. 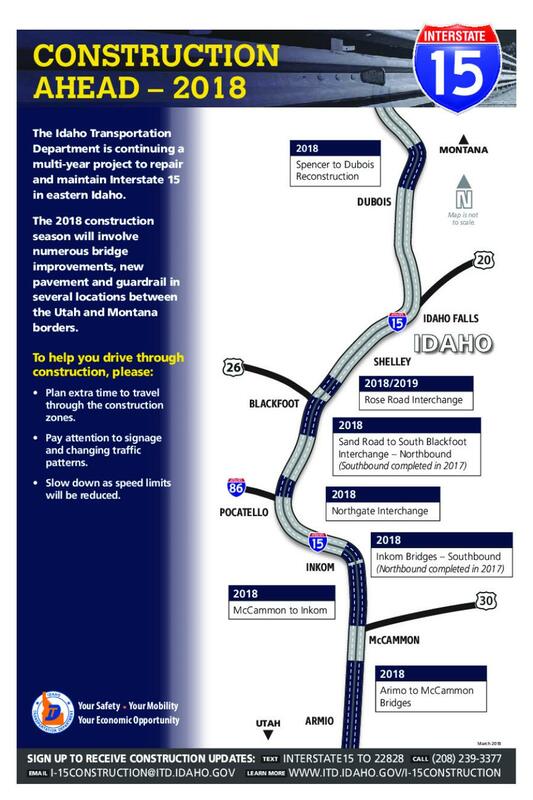 The Idaho Department of Transportation is continuing its multi-year I-15 construction project which this year will involve numerous bridge improvements, new pavement and guardrail in several locations between the Utah and Montana borders. 2018-2019: $13.8 million replacement and improvement project of Exit 98 north of Blackfoot at the Rose Road Interchange. IDT also will begin work in the 2018 construction season on a $17 million facelift project to U.S.-12 to revitalize aging infrastructure and to enhance safety throughout the corridor. Work on U.S.-12 will include the replacement of two bridges and the resurfacing of more than 50 miles of the highway between Lowell and the Idaho-Montana border. Construction will likely begin as early as April and conclude in late October 2018. The Washington State Department of Transportation plans to award the $80- to $100-million contract this spring to demolish the Alaskan Way Viaduct, fill in the Battery Street Tunnel and build new connecting streets in South Lake Union. Demolition is expected to begin in early 2019 and take nine months to complete. after demolition is complete, restoring roadways, sidewalks, street lighting and other elements to a temporary condition until the city of Seattle builds the new waterfront. Construction on the $1.87 billion Puget Sound Gateway Program is likely at least three years out. The first stage is expected to occur between 2021 and 2025 and the second between 2025 and 2030. The program is comprised of two projects, the SR 167 Completion Project and the SR 509 Completion Project. Combined, the projects will mean major improvements to freight mobility and decreased traffic congestion. The Oregon Department of Transportation is set to begin work this spring on a $60 million construction project fast tracked by the Legislature in an effort to alleviate traffic congestion between Johnson Creek Boulevard and the Glenn Jackson Bridge on I-205. The work includes building auxiliary lanes in three locations, paving the freeway, ramps and intersections, installing ODOT RealTime signs, improving the entrance to the multipath use at Glisan Street and improving sideway curb ramps in the construction area. Much of the work is expected to take place at night with multiple closures of on and off ramps, as well as cross streets near on and off ramps. The project is scheduled for completion in late 2019. ODOT is partnering with local agencies to develop an Interchange Area Management Plan to address problems on the I-5 Aurora-Donald Interchange (Exit 278) in Marion County. Originally funded at $3.4 million, the project was allocated an additional $25 million by the state legislature. According to the website, “The problems of the interchange are numerous. The interchange was built in the early 1960's when the interstate was constructed, and it is obsolete. Imagine the interchange when there was nothing located out there and only a few vehicles and farm equipment used it. “It has been over capacity at peak times for many years. It has significant safety issues and does not operate like a busy interchange should. Reconstructing this interchange is a high priority of the Mid-Willamette Valley Area Transportation Commission, Marion County and ODOT.” Construction is scheduled to begin in the coming months on an $18 million project to rehabilitate four I-105 bridges and ramps between the Delta Highway Exchange and downtown Eugene to bring them up to current standards. The bridges were built in the late 1960s and early 1970s and are in need of repairs and upgrades, including guardrails that meet current crash standards, structural deck paving overlays, seismic retrofits, joint replacements and concrete girder cracks repair.